DC Films have finally started to crank along, with regular releases planned across several characters. It's still a mighty bumpy road, but Wonder Woman has the potential to be a huge turning point for them, and I certainly have my fingers crossed. While I'm not a Batman v Superman hater, it's not a great movie, and Suicide Squad was only a slight improvement. C'mon, Wonder Woman! 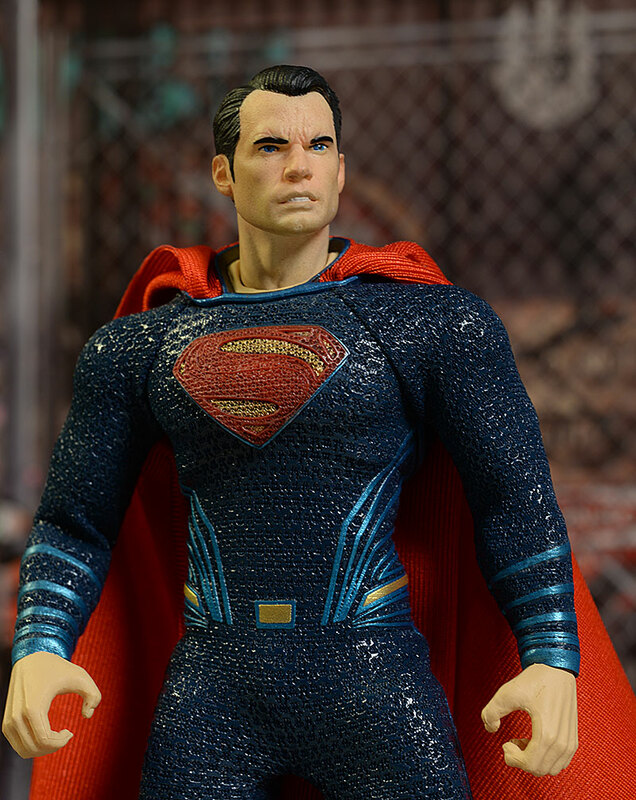 Tonight I'm checking out the latest BvS figure to come from Mezco in their One:12 Collective - Superman. This figure has been a long time coming, at least to 1:12 collectors. Mezco released their regular and armored Batman figures based on the film last year, and fans have been anticipating the completion of the pair for quite some time. We have at least one more to come based on this film - Wonder Woman. She should be shipping in 2017 as well. This guy has actually been shipping for awhile now, and I'm a little late to the party. But I have Flash, Zoom, and the exclusive Daredevil sitting here waiting patiently, and I wanted to get this guy covered before I move on. You can pick him up at most retailers for around $75. 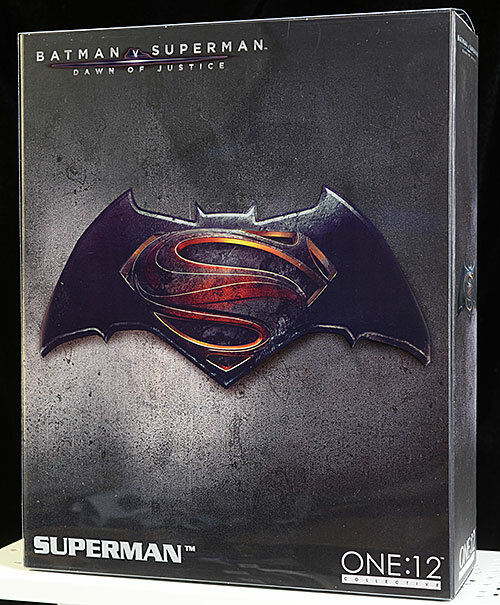 This box is identical to the one we got with the Batman DoJ figures, with the obvious swap of the name in the lower corner and the Superman photos on the back. It's heavy duty cardboard, with strong magnets holding the fifth panel flap closed, and it is completely collector friendly. 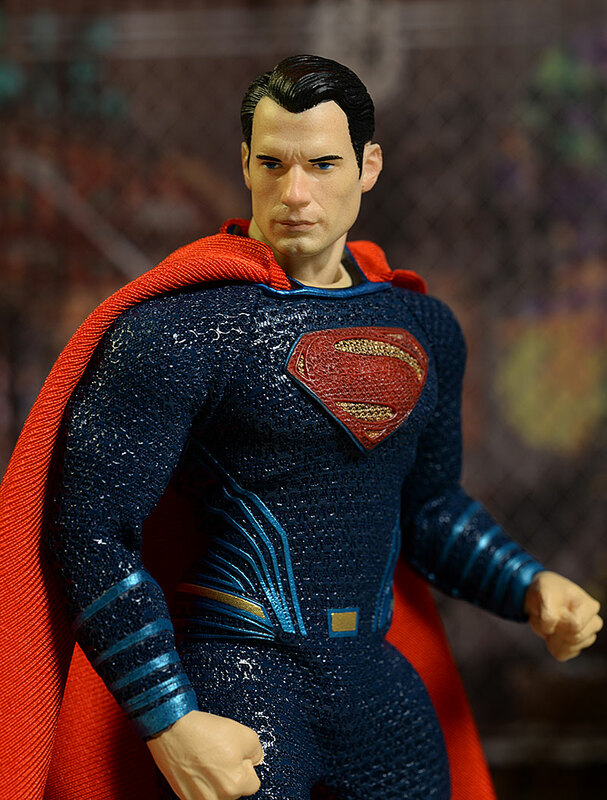 The figure includes not one, not two, but THREE portraits of Caville as Supes. Swapping is easy, and the heads stay in place once attached. Early photos of the figure washed out the face, and people freaked. They always do. There was no reason for the freak out - the heads are much nicer in person than what the early cell phone photos indicated. Huge surprise there. That is not to say they are perfect, however. Of all the figures they've released so far, this one comes the closest to a miss, although I can still see Henry clearly in the main portrait. The jawline and lips are just about perfect, but there's something in the eyes and nose that seems to be throwing it off just slightly. The hair is less detailed here as well, not a lot, but just enough to bring the quality down slightly. The third portrait is really a repaint of the angry expression, this time with glowing heat vision eyes. I actually prefer this paint job on this portrait, as it seems to fit the overall expression better. 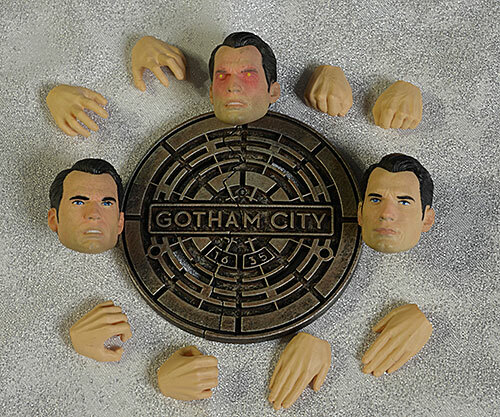 The various hands are sculpted for key poses, and they swap easily. The figure fits in nicely with other current 1:12 figures on the market, coming in at just under 6 1/2" tall. I've included a shot at the end with a recent Marvel Legend and Multiverse figure for comparison, but of course you can always use the LifeSizer feature above to compare to any figure you have. I think a big reason for the slightly less stellar sculpt is the less stellar paint work. Again, there isn't some sort of massive drop off in quality, but there are a few more nits this time around. All three portraits have slightly weaker hairlines, with some black coming down distinctly on the forehead, especially near the part. Unlike earlier releases, like Spock, this isn't a subtle transition but a pretty abrupt cut, and creates a slightly weird, uneven look. The standard and angry heads have good, clean eyes, but both also have weaker eyebrows. The skin tone is washed out, even in person, and the lip color on both angry portraits is almost non-existent, adding to the washed out look. The underlying body is very well articulated, as we've seen with past releases. This is the more buff superhero version of course, and it's appropriately bulked up. The neck works extremely well, allowing for lots of tilt and lean in every direction. This means you can add life and personality to poses without any restriction. The heads swap neatly too, and stay attached when you're working with the figure. The shoulders are a little restricted by the costume, but you can still get great arm poses. The hands swap easily as well, and yet they stay attached when posing. The torso and waist are less restricted by the suit than I expected, and the hips, knees, and ankles can take deep and short stances alike. I'm particularly happy with the ankles, which seem to have a greater range of movement, including rocker movement, than previous figures. As much as I love getting three portraits, it wasn't quite enough for me this time to go that extra half star. I've already discussed the portraits in some detail, but suffice to say their inclusion is a big plus in this category. There are also four sets of hands in total - he comes wearing fists, and you can swap in open palm flying hands, tight grip hands, or wide grip clutching hands. The sculpts are all in scale, and swapping is easy, with no fear of breakage. 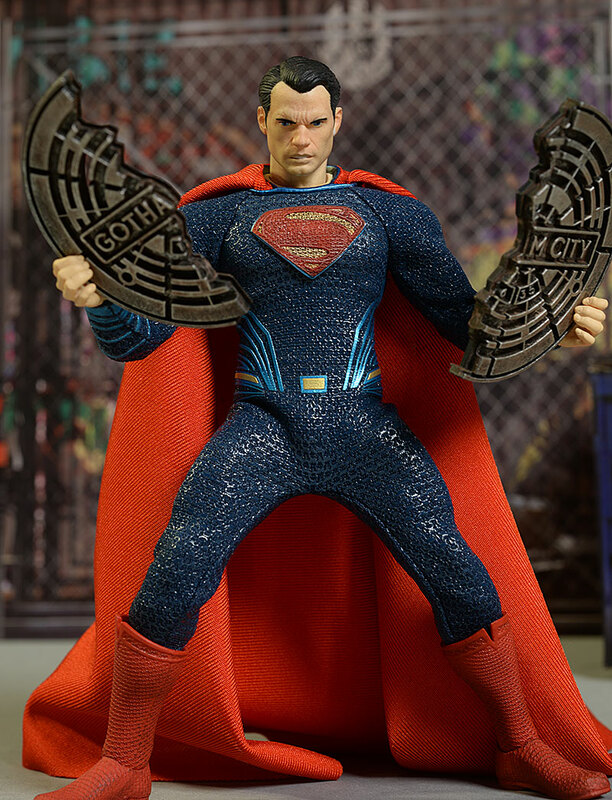 His one additional accessory is the break apart Gotham City manhole cover. It's in scale and looks good, and should be something you can easily add to the battle scene in a realistic way. 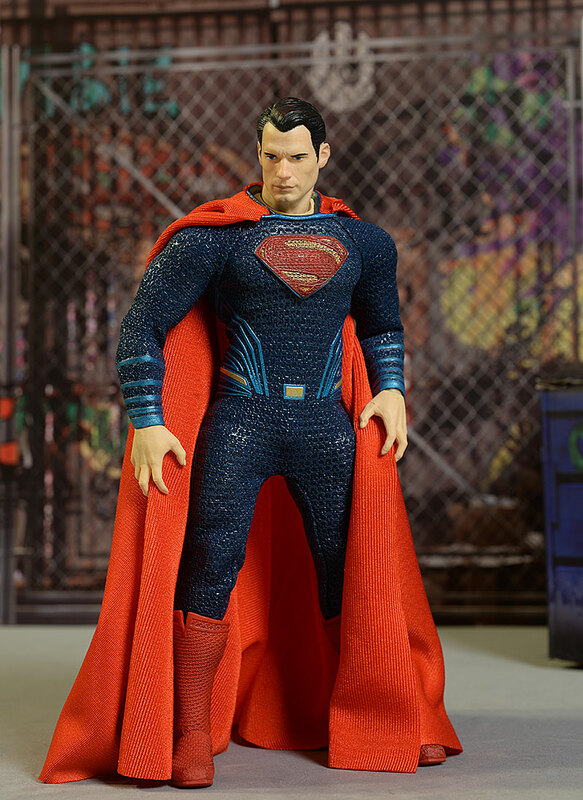 Like all One:12 Collective figures, he comes with the standard display base (this one with the BvS logo of course) and the choice of a foot peg or a clear plastic flying support. 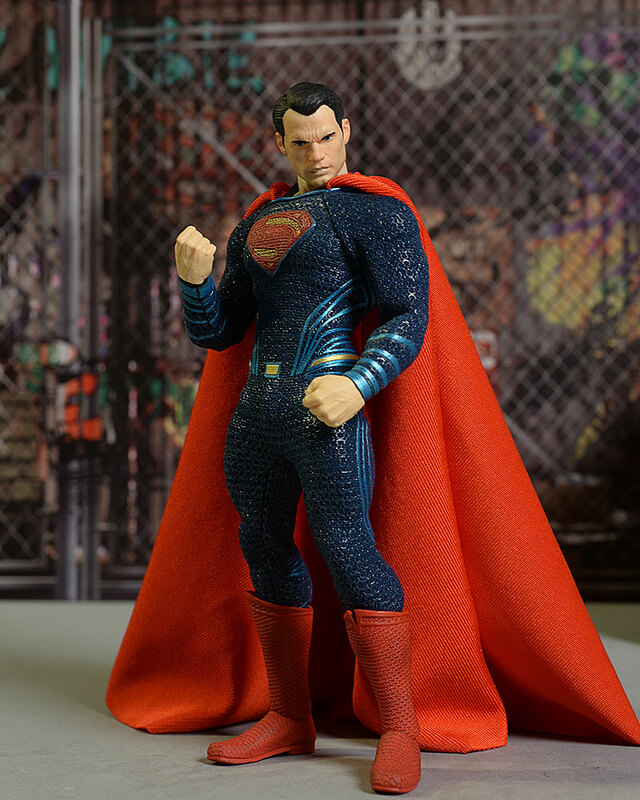 This support includes the complex set of wires which allow you to pose the cape in different ways as well. This is would be a terrific outfit in any scale, but considering it's only 1/12? That takes it to another level. One of my bigger issues with both versions of Batman was the cape. That's not a problem for Superman, who has a much thinner, softer cape that flows beautifully off his shoulders in just about any pose. The length is about right, and if you use the flying display support, you can create all sorts of cool poses with it. The ribbed suit fits tightly, and the rubbery exterior is extremely high quality. This texturing extends to the boots, which are made from a soft rubber material. The sleeves are long enough to cover the wrists in most poses, and the tailoring is extremely good. It does bag a little around the waist and hips in deeper stances, and I'm sure some will complain that the crotch hangs too low in those same deep stances, but that's to be expected with this sort of material. 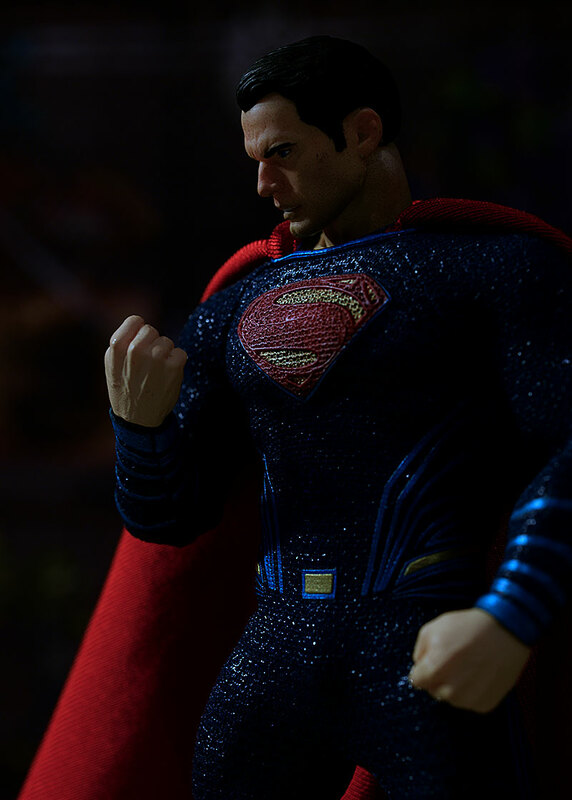 You now have Superman squaring off against Batman - what more could you want? 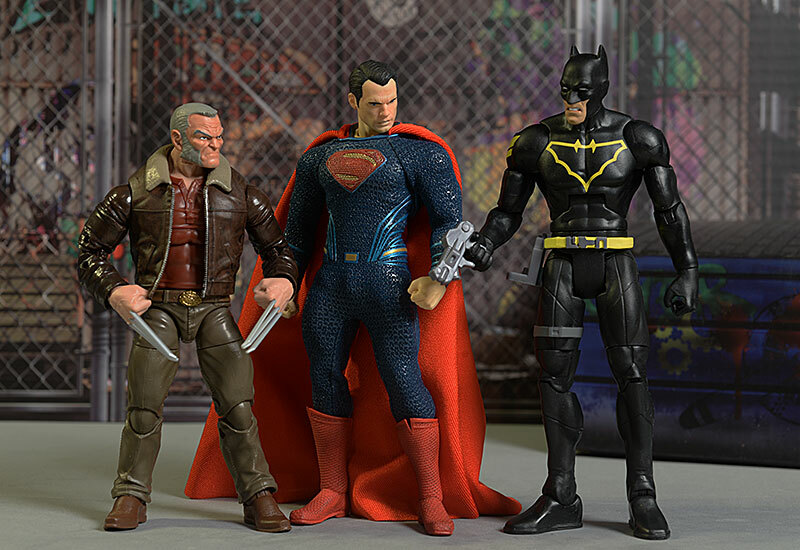 I suspect fans of the character will be anticipating the release of a comic themed version, but this guy allows for a much better display with the previous armored and regular BvS Batman figures. With multiple portraits, you can also swap from "Do you bleed?" battles to "My mom's name is Martha!" friendships with little trouble. 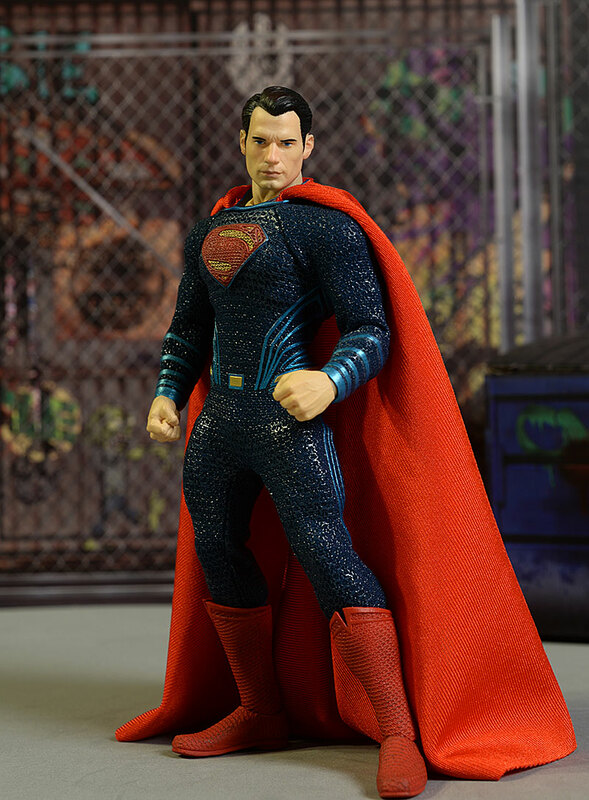 Most One:12 figures are in the $70 - $80 range, depending on the license, the complexity, and the production run size. This one comes right in the middle at $75, but with fewer accessories, it's a harder sell. The price point will effect my Overall, moving it slightly downward. No real issues here. Heads and hands swap cleanly, no fear of breakage, and even the rubbery suit seems able to handle normal handling and posing without issue. Early photos of this figure had people worried - they didn't need to be. While he's not my favorite so far, he's certainly not a bad release. There are a few nits, and I think it's the paint that causes the majority of the problems. 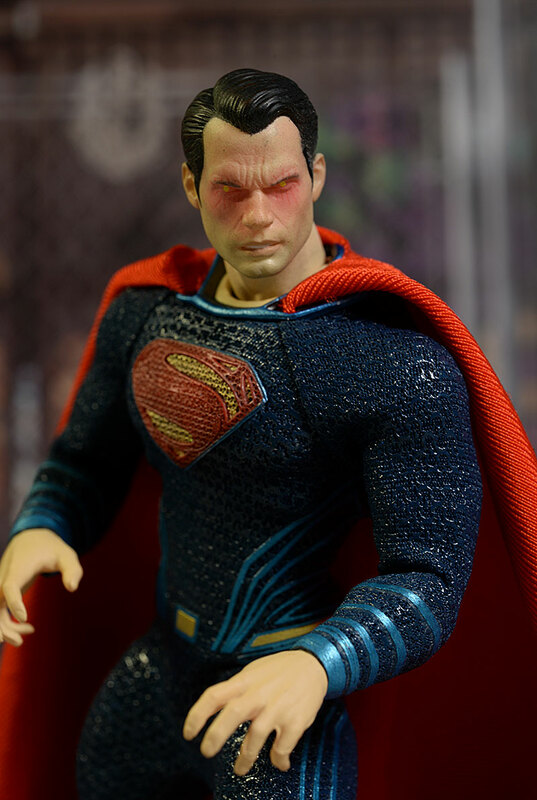 The washed out skin tone and slightly sloppier eyebrows and hairline make it tough to judge the sculpt, and make the $75 price point a bigger issue than it normally is. - comes in at $75. - also has him at $75. - Entertainment Earth has him at $75 as well. 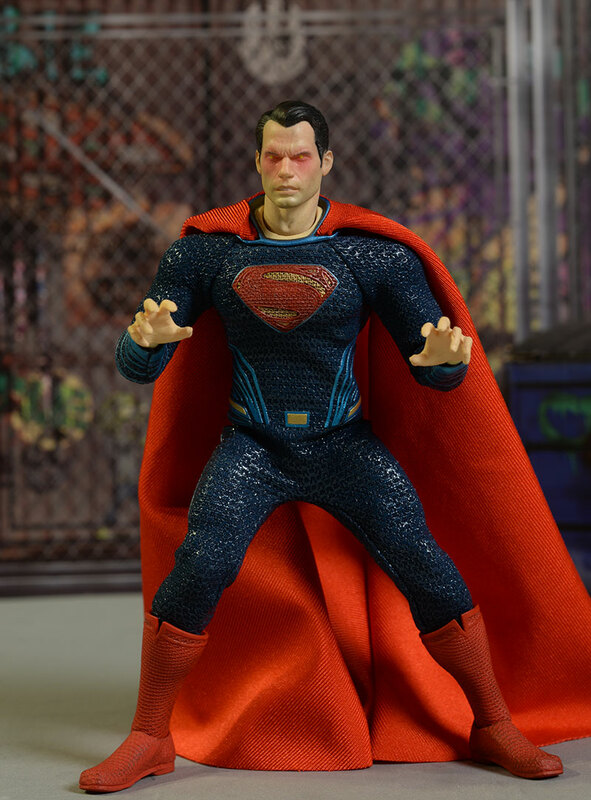 My most recent Mezco review was the comic based Joker, and prior to him I looked at the Punisher, Green Arrow, the Frankenstein Monster Diorama, Frankenstein Monster, the BvS Batman, the Bvs Armored Batman, Captain America, Star Trek Kirk, the Mirror, Mirror and Cage variants of Spock, Sulu, the Toy Fair exclusive Spock, and the regular release Spock as well. Other One:12 Collective figures released so far include Dredd and his Lawmaster, the NYCC exclusive Judge Dredd, the DKR Batman and Mutant two pack, the Batman exclusives, and the initial DKR Batman.